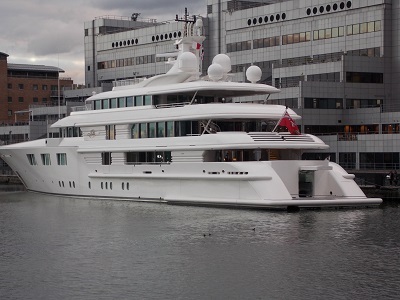 The Ilona superyacht has been berthed in West India Dock since August and today she is joined by the superyacht “Lady S”. Estimated to have cost 70 million dollars, the 225-foot long vessel is owned by Daniel Snyder, an American billionaire best known as the owner of the Washington Redskins American football team. The Washington Redskins play in London at the end of October which may be the purpose for the visit. 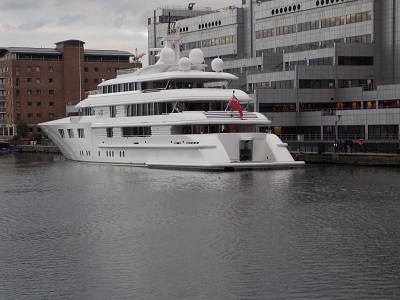 Interestingly, the Kismet superyacht owned by Shahid Khan owner of the Jacksonville Jaguars was berthed in the West India Dock recently. 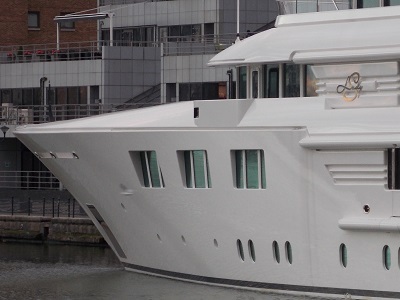 The 224.74ft /68.5m yacht ‘Lady S’ was designed by Walter Franchini and refitted in 2013 , she can provide accommodation for up to 12 guests in 7 rooms, including a master suite, 1 VIP stateroom, 3 double cabins and can carrying up to 19 crew on board. 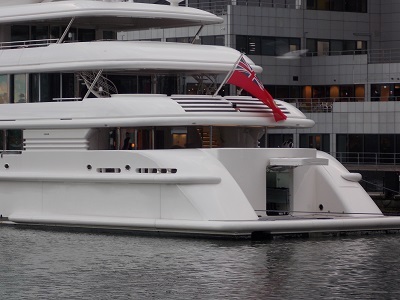 Like many of the large luxury yachts, it has all the latest amenities including Gym, Air Conditioning, Lift, Deck Jacuzzi and Stabilizers. 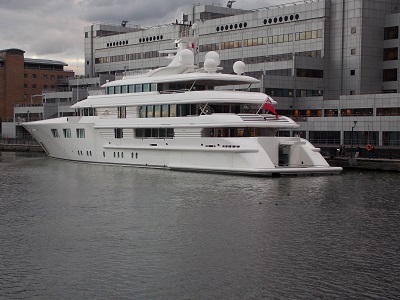 It is not known how long the yacht will be in West India Dock or its destination after it leaves. 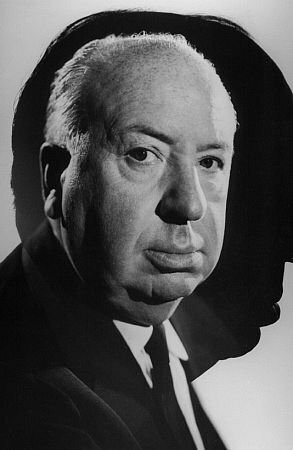 In a previous post about Alfred Hitchcock, I wrote about his formative years when he moved to Limehouse. 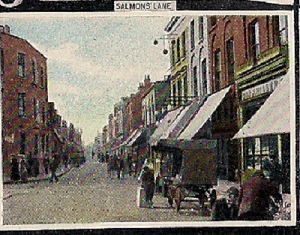 The Hitchcock’s moved from Leytonstone to 175 Salmon Lane in Limehouse and opened a shop selling fresh fish, before Alfred’s father purchased 130 Salmon Lane and opened it as a fish and chip shop. One of the problems of looking at Hitchcock’s childhood is to separate fact and fiction because later in life Hitchcock would tell stories about his childhood which were often fanciful and exaggerated. This blurring of fact and fiction about Hitchcock’s life has fascinated many writers, but very few have used Hitchcock’s early life to write fiction. One writer who has decided to write about the young Alfred Hitchcock is Jude Cowan Montague with her soon to be realised Young Hitch series. Jude has considerable knowledge of the Salmon Lane area after living there in the 1980s. As Jude relates the area was very different in that time. When I lived nearby in the late 1980s I squatted in an old council block which has now been demolished, so I have my own sentimental connection with times gone by. It was quite run down in those days, but the development of the docks on the Isle of Dogs was already in progress. 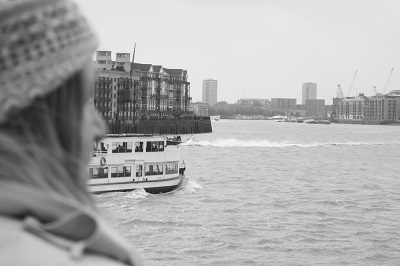 Recently Jude revisited the area to get inspiration for the new books and understanding that Limehouse has always been an interesting mix of old and new. Although the Young Hitch series are a work of fiction they do use real-life history, newspapers and first-hand accounts for historical accuracy. Hitchcock was famous for observing life and trying to found out what made people tick, there is no doubt that Hitchcock would have been have been aware of an East End around him that was in turmoil. Industrial strikes, Women’s suffrage , anarchism and general unrest were commonplace, if this was not enough the start of the First World War saw Zeppelin bombing raids. Hitchcock was also fascinated with murders, he was fascinated by Jack the Ripper and the cases of Dr Crippen and Adelaide Bartlett. Hitchcock’s formative years were probably vital for developing his famous macabre sense of humour. Sitting in the red plush seats of the Picture Palace, Alfred Hitchcock, eleven years old and eager to grow up, shook as a snake of fear rose from his toes, wriggled through his socks and slid up his sweaty legs. On the wide screen in front the hero squeezed through a hole and made off for the horizon. He looked back and laughing, in what Alf thought was in a rather superior manner. There was a smug and distasteful manner revealed by the close-up. The bereft villain shook his fist, silhouetted against the sky. His victim had got away. ‘Curses!’ Alf mouthed, twirling an invisible moustache. Baron von Bingsten was not acting in his best interests by drawing attention with his gyrating gurning gymnastics. But then Alf had never met a real baron. Perhaps all nobs, as his father called them, had over-dramatic movements. But he doubted it. He couldn’t test his theory. 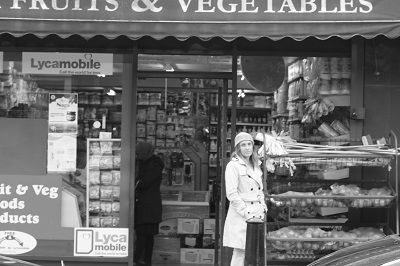 Grocers’ sons didn’t have the opportunity to mingle with the nobility. If only his Da had a title. Lord Leytonstone? Could be? It seemed you had to be an aristocrat to have a real adventure, if you went by the stories he read. If his father really thought about Alf’s needs, and wanted to give him all the best advantages in life, he would get himself a title. But despite the lip-service, parents did not think of their children enough. His Da was always thinking of his business. That was why he had dragged Alf and the Hitchcocks from a perfectly good house in Leytonstone to a crummy place like Limehouse. Alf felt a tear spring to his eye as he dwelt on this injustice. Through the rosy mists of memory he thought of the beloved house he had left behind. There were roses wreathed around a porch and a mother waiting at the garden gate in a checked apron, greeting him with a warm smile. Or was that the cottage in ‘The Vicar’s Daughter’, on last week? It didn’t really matter. The point was the same. He licked a salty tear away, smiling to himself and settling down for the next picture wishing he had some more peanuts. He idly wondered if he had enough for an ice-cream, but he did not have to pull out the lining to know his pockets were empty apart from the sticky caramel sweet wrappers. And a dead pigeon’s wing. He was out of luck and out of pennies. Soon it would be time to go home. Back to the real world. Update : Jude’s first book in the series ‘Young Hitch in Forbidden Flames’ was published on 3rd January 2017 on the anniversary of the Siege of Sidney Street. Regular readers will know that I am always keen to find books with a link to the Island. 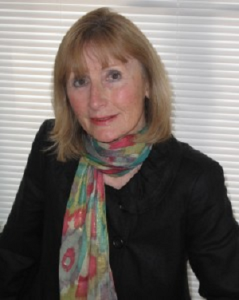 Very few writers have written about the Island in a series of books, the great exception is bestselling author Carol Rivers who has written a number of books which generally feature characters on the Island. Carol’s gritty and heart-warming East End family dramas are greatly influenced by her grandparents who lived in Gavrick Street and then Chapel House Street on the Island. The books are widely praised for their realism and appear regularly in many bestseller charts and Carol has a loyal readership in the UK and increasingly in the United States. 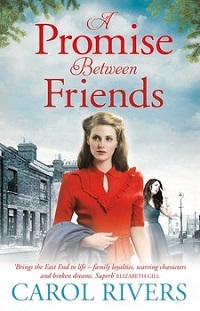 I was delighted to receive a copy of Carol’s latest book, A Promise between Friends which takes place in the early 1950s and follows the adventures of the ambitious, 19-year-old Ruby Payne and her lifelong friend Kath Rigler. Ruby and Kath both suffer from issues that bring unhappy memories but are looking to start an exciting new independent life by moving into a new flat together. London in the early 1950s was a city in transition, still suffering from shortages and bomb damage whilst trying to forge a new future. In the pursuit of the good things in life, some people were willing to take chances and the book captures the period when shady deals and false promises led many people into trouble. Ruby desperate to rise above her humble beginnings finds out that there is always a price to pay. What really sets Carol’s book apart from many others of the type is that she creates believable characters who are faced with situations familiar to many of us, in overcoming these problems they often seek help from their extended families who are considered of great importance. However, Carol’s books acknowledge that even though extended families were a great source of support, sometimes those loyalties were tested and could lead to conflict. This is another characteristic of Carol’s books, she often displays some of negative aspects of London life when characters go off the rails. But for all the pain and conflict, Carol pays tribute to the strong characters, often women who manage to keep going through adversity. Ruby and Kath are two such characters who will not be defeated by life’s injustices and hardships. A Promise between Friends is the latest book from a writer who still takes a close interest of events on the Island and continues to be inspired by this small piece of East London. Like many people who live on the Island, I will occasionally take the short ride to Greenwich or walk through the foot tunnel. 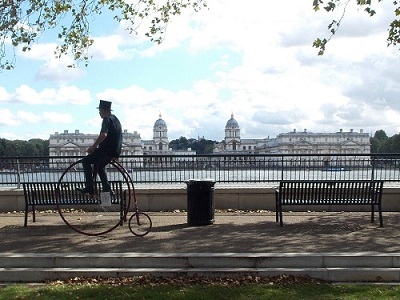 Greenwich is a favourite with locals and visitors who come to admire its many delights. 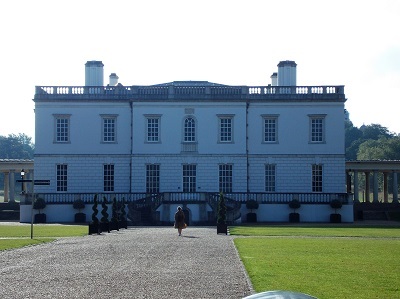 In the numerous times, visiting Greenwich I have never visited the Queen’s House located near the National Maritime Museum. Therefore I was delighted to be invited to a preview of the newly restored Queen’s House before it opens to the public on October 11th. 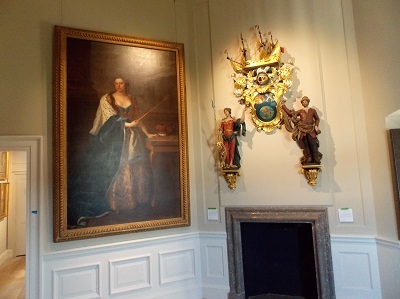 The House’s closure has given the Royal Museums Greenwich the opportunity to refurbish galleries, including the King’s Presence Chamber and the Tulip Stairs, as well as introducing new displays and colour schemes, bespoke lighting and new interpretation. The window-glazing and flooring of the Grade I listed building has also been upgraded. The Queen’s House has a remarkable history and is considered one of the most important buildings architecturally in the country. 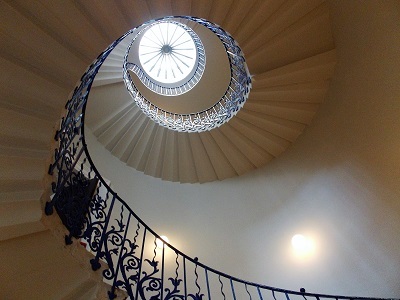 The famous architect Inigo Jones was commissioned to design the building in 1616 by King James I’s wife, Anne of Denmark , although she never saw Inigo Jones’s Classical design completed because she died in 1619 when only the first floor had been built. In 1629, James’s son Charles I gave Greenwich to his wife Henrietta Maria and work on the Queen’s House resumed to be finally completed around 1636. The house is considered one of the first fully Classical buildings in England and marked a distinct break from the traditional, red-brick Tudor style of building. The Civil War meant that Henrietta Maria had little time in the house before she went into exile, her husband was executed and his property seized by the state, although she did eventually return after the restoration in 1660. 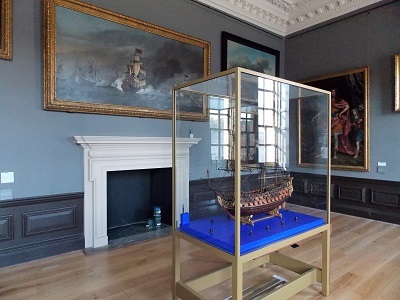 The house was then used by members of the royal family and for other purposes until 1805, when George III granted the Queen’s House to a charity for the orphans of seamen, called the Royal Naval Asylum. This remained until 1933, when the charity moved to Suffolk. It was taken over by the National Maritime Museum in 1934. 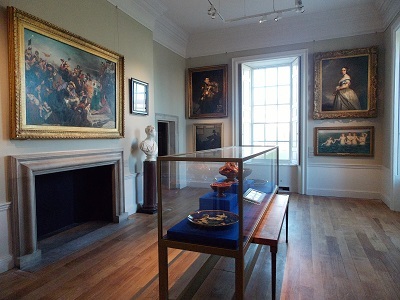 To celebrate its 400th anniversary in 2016, the Queen’s House has been refurbished to celebrate its Royal connections and the National Maritime Museum’s outstanding art collection. Turner Prize winner Richard Wright has created a new artwork for the ceiling of the Great Hall which is inspired by the remarkable Tulip Stairs. Visitors to the re-opened house will also be able to see Orazio Gentileschi’s Joseph and Potiphar’s Wife displayed in this iconic building for the first time since 1650. 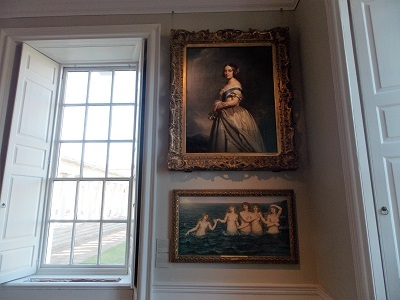 The painting, which is part of the Royal Collection, was one of a sequence commissioned for the Queen’s House by King Charles I and Queen Henrietta Maria. The King’s Presence Chamber and Queen’s Presence Chamber have been used to house paintings illustrating the kings, queens, consorts and courtiers associated with the House and Greenwich during this period.This helps to bring the history of the Queen’s House to life and illustrates the connection with the Tudor Placentia Palace that once stood near the site. 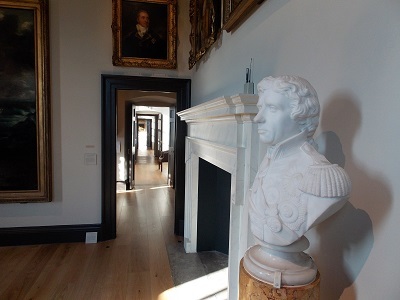 Walking around the remarkable house provides plenty of evidence of how Greenwich was at the centre of Royal life for centuries and how little remains to remind us of its Royal connections. 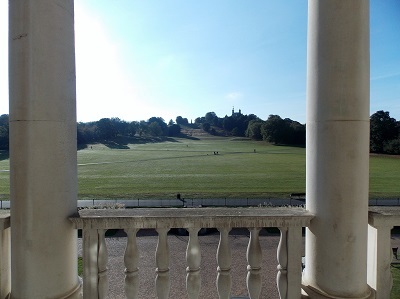 Standing on the balcony on the first floor gives you a wonderful view of Greenwich Park but when you walk outside you realise why so many people fail to visit the house, despite the grand entrances there are no large doors, entry is via the colonnade and it is easy to believe that the house is part of the larger complex not a standalone house. 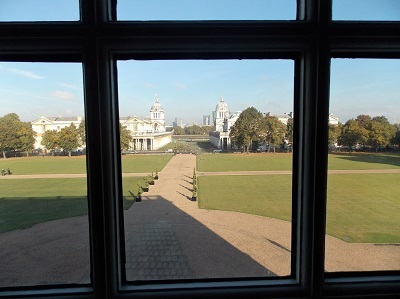 There is another interesting element that is relevant to Islanders, Queen Mary stipulated that no building should block the view to the river, so when Christopher Wren designed the Naval College he left a gap in the building. When viewing from Island Gardens, the Queen’s House is nicely framed by the Naval College and offers a wonderful view of Greenwich Park behind. 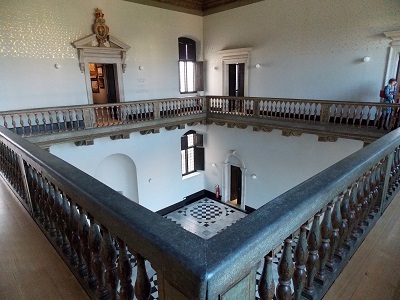 I would highly recommend a visit to the Queen’s House to enjoy some of the wonderful features and the art collections which help you to understand the building’s history, and its considerable significance. 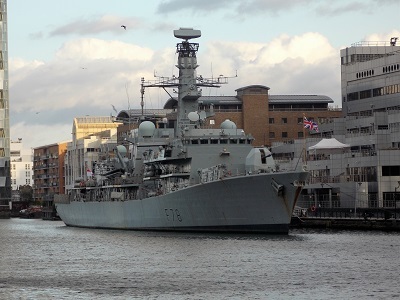 Last afternoon saw the arrival of HMS Kent which is one of the Type 23 frigates within the Royal Navy. 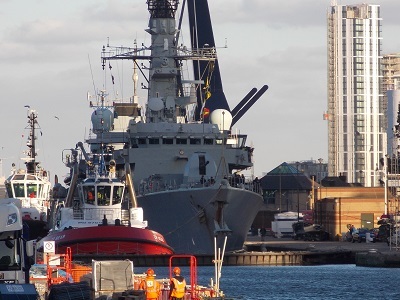 This is the second visit to the dock in 2016, the HMS Kent last visited in May when she was preparing to make making her way to Scotland take part in the Battle of Jutland centenary commemorations, in which she played a central role. The ship was built by BAE Systems on the Clyde and was launched in 1998 by Princess Alexandra of Kent. The ship has a length of 133 m (436 ft 4 in), beam of 16.1 m (52 ft 10 in) and can carry a crew of up to 205. 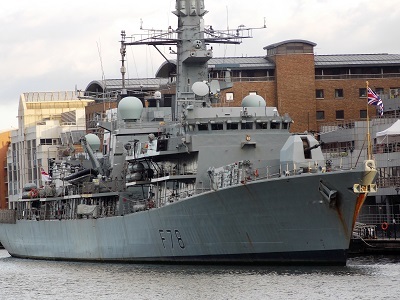 HMS Kent is the twelfth ship that has had this name in the Royal Navy and has travelled the world since her launch in a number of deployments. The ship has been involved in a number of anti-piracy and anti-drug missions in recent years including actions against smugglers, pirates and terrorists. 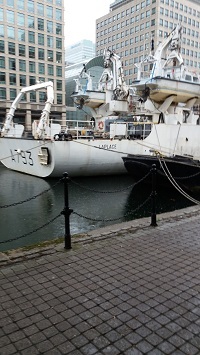 The purpose of the visit is not known at this time or how long the ship will be berthed in West India Dock. 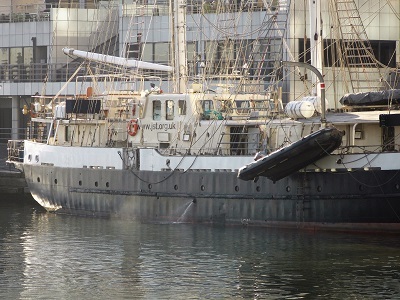 After all the recent activity in West India Dock recently it is nice to welcome a regular visitor to the dock with the arrival of STS Lord Nelson which last visited in August. 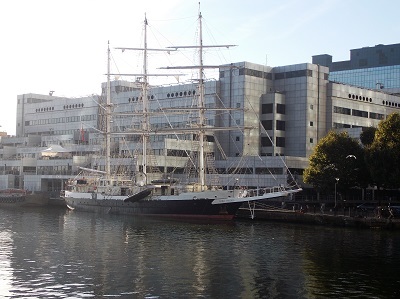 The Lord Nelson was the first tall ship that was purpose-built with the aim of integrating disabled with able-bodied people. The ship was the fulfilment of the vision of JST’s founder, Christopher Rudd who believed that physically disabled people should be able to sail alongside able-bodied people as part of the crew. 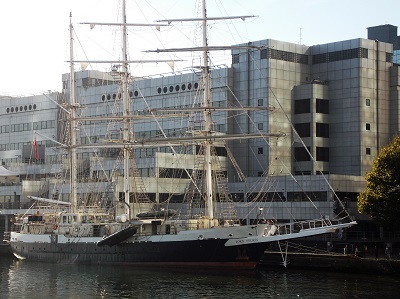 The charity raised the money to build the ship aided by a grant from the Queen’s Silver Jubilee Appeal which led to the charity to being called the Jubilee Sailing Trust. The Lord Nelson sailed on her maiden voyage in 1986, Since that voyage, the STS Lord Nelson has sailed 461,943 Nautical Miles and taken nearly 29,000 people to sea. Of these, 10,500 people were physically disabled and more than 3,500 were wheelchair users. One of the most remarkable aspects of the ship is that Lord Nelson’s has many facilities for disabled crew including flat wide decks, powered lifts, speaking compass, Braille signage and bright track radar for visually impaired crew members. An induction loop and vibrating alarms have been installed for hearing impaired crew members. There are also special cabins, toilets and shower facilities for disabled crew. However, the whole purpose of these facilities is to enable the disabled crew to work side by side with the able-bodied crew, there is no room for passengers, everyone has duties to perform. Between 2012 and 2014, the Lord Nelson undertook its greatest challenge by completing a voyage around the world visiting 7 continents and 30 countries. Whilst in Australia and New Zealand she raced in tall ships races and also carried out an Antarctic Expedition. 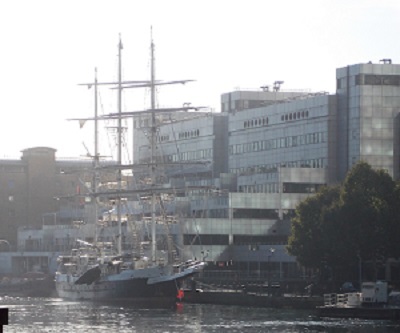 The Lord Nelson and her sister ship, the Tenacious are regular visitors to West India Dock and both ships are a wonderful reminder of what can be achieved by fulfilling a vision of providing opportunities to people with a wide range of abilities. 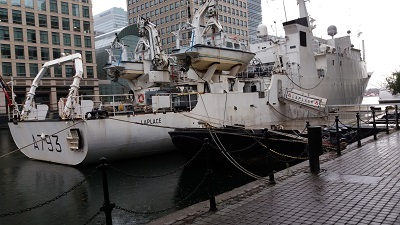 An unusual visitor to West India Dock is the Laplace which is a hydrographic survey ship of the French Navy and one of their Lapérouse-class survey ships. The ship was launched in 1988 and went into service in 1989. The ship is 59 m (193 ft 7 in) long and has a beam of 10.9 m (35 ft 9 in). The crew consists of 3 officers,10 non-commissioned officers,18 enlisted personnel and 11 hydrographers. Earlier this year, after the crash of EgyptAir Flight 804, Laplace was dispatched to search for the black boxes of the aircraft. She departed her base of Porto-Vecchio, in Corsica in May and in June detected a signal from one of the black box recorders. 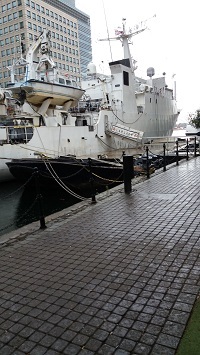 It is not known how long the ship will be in dock, but a visit from an hydrographic survey ship is quite rare.